Before I came to DR, I had a lot of doubts about going in there, mostly because its bad reputation as "dangerous place". I red a lot on the Internet how dangerous this country is; therefore I was expecting the worst after I came here. I imagined worst case scenario for me: that in first week of my stay in Dominican Republic I will be robbed and will have to go back to my country. Nothing bad has happened, though. I was there for over a year (and when I am writing these words I'm here for the second time - already few months). During my stay,I had specific lifestyle and style of travelling that many people would consider dangerous. I've been travelling in Dominican Republic alone, on my motorbike with backpack mounted on the bike's backseat, with many goods inside. However, as I said before - nothing wrong happened to me and I never had ANY bad or dangerous situation with local people - usually they were just friendly, helpful and kind. 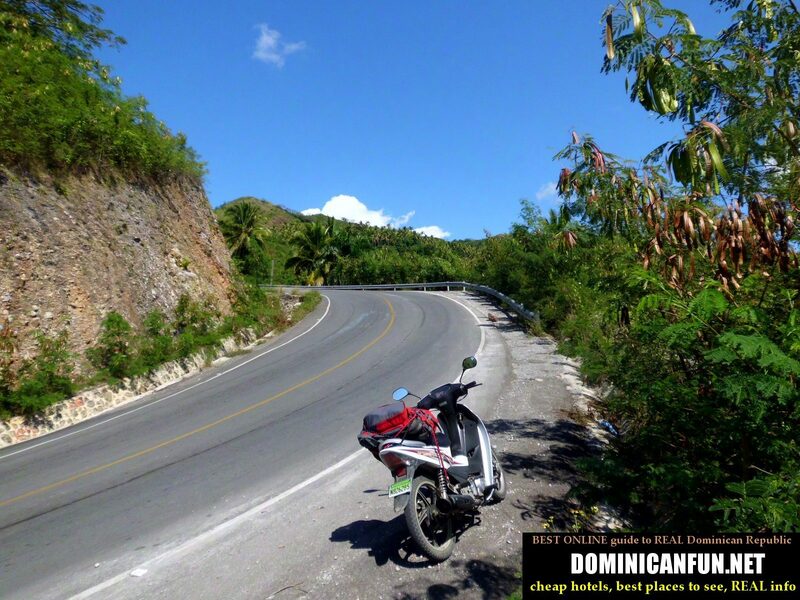 Here is how the author of this blog travelled in Dominican Republic: My own scooter, mounted backpack with all my stuff, and on the seat - always sober and conscious driver (me) 😉 And believe it or not - I even wrote best guide to Dominican Republic, now you know that too 😉 ! The "Safety factor" and the fact if you do feel safe in your surroundings depends a lot where do you stay/live exactly. Is it big city (Santo Domingo especially) or maybe some small town/village ? The only place that I consider not so safe in Dominican Republic regardless if you were there during the night or day - is Santo Domingo. Such kind of big cities are like magnet for all thieving and robbing scum - they may feel anonymous in there and feel that the police will never catch them. In the small towns (actually , like I said before, from the dominican cities I would consider Santo Domingo as the only dangerous place per se), villages etc. - where everyone knows everyone and where people do care about each other - crime rate is way lower (or non existent) than in Metropolis like Santo Domingo. Like I said before - many Dominicans exaggerate any potential danger and such mental state is mostly because of the TV they seem to just love to watch. They are bombarded by negative news everyday and later think that everything in this world is dangerous...while is not.